I saw The Parson Red Heads this weekend downtown open for the homies Castaneda, and to be honest I was a bit skeptical when they took the stage at The Bordello. 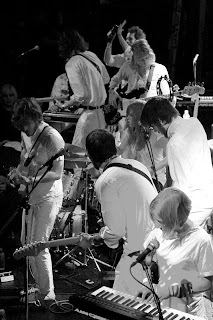 There were 8 people on the small stage, all wearing white head to toe, the guys looking hip-tastic with their scruffy hair, beards and skinny ties. I was about to write them off and head to the bar for some St. Patty's day libations, but their first tune was damn catchy. So was the second. In fact their California pop infused sound had me shaking all through their set. They sort of sound like a cross between The Spinto Band and Call and Response. Their live show was great because on almost all the songs you got to hear their catchy hooks and male-female harmonies, but they also broke it down and jammed out a little on the end of each song. I suggest you catch them live if you can....check their myspace page for tour dates.